When I was growing up, we went to church every Sunday and many Wednesdays. By “we,” I mean my mother and the kids. My dad stayed home, asleep. He called the service time of 10 AM an “un-Godly hour” and assured us that if the service were at 11AM, he’d be there every week. Somehow I doubt it. He’d show up two or three times a year. I thought, in my child’s mind, that it was weird; that it was somehow unfair. By contrast, when my husband was growing up, he and his family went to church almost not at all. One summer, a year or so into our relationship, he noted that between weddings and a funeral, he’d been in church more in the most recent three months than he had in the previous decade. 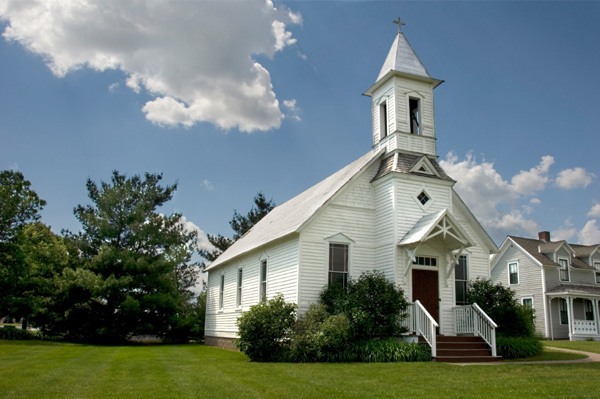 When my husband and I were preparing for our wedding and marriage, we discussed the “church thing.” I had long since stopped attending with the frequency of my childhood, yet I liked going every once in a while. As we thought about bringing children into the world, we thought about what kind of religious foundation to give them. After a discussion or two we came to a “less than I had but more than he had” kind of compromise. We said that so long as we found family-friendly churches, going about every other week and not stressing if it doesn’t fit that pattern exactly (in either direction) was acceptable to each of us. Enough so that they would feel comfortable in church, and would have some basis for questions and decision-making as they aged. And it would be a whole family activity. When Alfs and Woody were small, we mostly followed this plan, and it worked out just fine. We found nice churches and knew a few people, but no deep connection to one congregation. When we moved to our current town, and particularly after Sunshine was born, the schedule changed. It just happened that we found a really nice church and it was easy to be more involved than every other week. Alfs joined the choir, I started helping in the nursery, later moving to teaching in the toddler room. Woody has fun there, and so does Sunshine. At the same time, my husband’s work has become more and more demanding. There are weekends he’s at work most of the weekend, and he typically has long hours anyway. At some point in all this, there was a Sunday morning that he seemed particularly tired and I offered to let him sleep in while I took the kids to church. He smiled appreciatively, though sleepily, rolled over and went back to sleep. This occurred a few more times over several months, then more often and more often. I realized it was becoming a pattern — and I realized it didn’t really bother me that we had developed a pattern just like my parents. It didn’t seem weird to me, or unfair. This time alone that my husband has on Sunday mornings to get a little more sleep, or catch up on house projects, or exercise, or just drink his coffee leisurely, were his only bits of time alone in the house, and often his only bits of time alone in his own head. I knew it helped him, and I knew that if I asked, he would get up and get dressed and join us. He does a couple or three times a year. Church is still a family activity, even if one member is still in REM state on Sunday mornings, because it is wholly supported by the whole family. My husband may not attend Sunday services with anything approaching frequency, but he does pick up Alfs from choir practice on Wednesday, has helped with the spring grounds clean-up and other events, has helped me get Sunday school lessons together, and so on. With the busyness in the rest of our life, his Sunday morning sleeping-in is a little thing overall, and I am glad to help him get that bit of balance. Besides, he usually lets me sleep in on Saturday mornings.